Grab a hammock between the palms, or duck under a palapa and finish the last few chapters of your beach read. Grab a waterfront table and dig through your beach bag for juice boxes and pretzels. Grab the hands of your goggled little ones, and go hunting for new aqua-adventures. Time it just right to catch the sunset. Keep your camera handy - you're going to want it. You're right next to a private beach. Your kids will love the children's pool with two waterslides. Childcare is also available onsite. Cable Beach Golf Club is a 7 minute drive away. You'll have a blast on the waterslide! No towering high rises here – sprawling neighborhoods of residential-feeling Georgian/Colonial-style villas welcome you with their cheery, saltwater taffy palette. Canals and waterways connect each house, all with lush gardens and boat docks, and most with private beaches. A master-planned marina village, Sandyport Beaches Resort is a secure, gated community at the western end of Nassau’s famous Cable Beach. A leisurely two-mile walk gets you to the glitzy part. Grab your most glamorous sunglasses and head that general direction. Spend (never enough!) hours lounging on the sand, or hopping around to all seven resort pools. Canal- and lagoon-front villas have a beachy vibe, with awning stripes, pineapple and seahorse patterns – plus plenty of living/dining/blanket-fort-making space. Early birds get first dibs on your kitchen’s cereal selection, and may be able to squeeze in a quick tennis match before the late-sleepers make their bleary-eyed appearance. When you’re ready to venture out, head for Olde Towne, where oceanfront dining, shops, casinos, clubs and theaters beckon. To make your visit even more memorable, plan an excursion – kiss a dolphin, swim with sharks or indulge in a Bahamian culinary experience. - Guests that are planning to arrive after 11:00 PM must contact the property in advance using the information on the booking confirmation to arrange check-in. 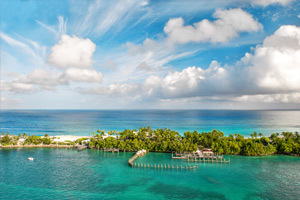 The capital city of the Bahamas, located on New Providence Island along several miles of gorgeous beach. Go snorkeling and experience the beautiful coral reefs. Visit Bay Street for shopping and fine dining. Come to Nassau during the Junkanoo Festival for a parade featuring fun and unique costumes.